In Lebanon some 28.5 percent are estimated to live below the relative national poverty line of $4 a day, the vast majority of whom live in rural areas. Poverty remains a pressing issue as rural Lebanese have little access to the services and resources they need to partake in income-generating activities. 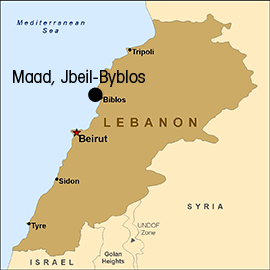 This is exacerbated by the influx of Syrian refugees who now make-up a quarter of Lebanon’s population. Lebanon’s national strategy is to reduce massive external migration to other countries and internal migration from rural villages into the cities. A Lebanese NGO founded in 1998, PRODES’ mission is to promote active, positive and responsible participation of citizens in Lebanese society while respecting their traditions, and ensuring greater availability of opportunities for personal and collective improvement. The project empowers Lebanese women by developing their skills in tourism and hospitality services, and equipping them with the tools to establish small businesses in their rural villages.